"Christianity is not a system of oppressive rules. peace find rest in its shade." 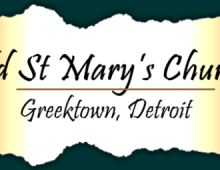 Old St Mary’s is the third oldest Roman Catholic Church in Detroit and the first German Church. 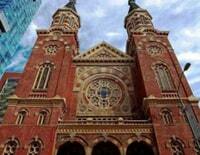 It was first built on the present site in 1841 by a parish of German Catholic immigrants at a time when the total population of Detroit was not much over 5,000. Not including labor, the original brick church cost a little over $239. The present church, replacing the earlier structure, was constructed in 1884, and styled in Victorian Gothic by Peter Dedericks, a native architect. The beautiful polished columns inside are of solid granite and impossible to replace today. The cornerstone for the First Church, built on the same site as the present site as the present stone, was laid on the feast of Corpus Christi, June 19, 1841. 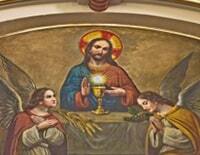 OSM is a home for lovers of Catholic tradition, devotions, and Church music. Experience the presence of the Lord and pray where peace and tranquility lies! Daily Mass at OSM is 12:15 pm, and the Sacrament of Reconciliation is available every day of the week — 365 days of the year. Here, many miracles and cures have been attributed to our Blessed Mother’s intercession (testimonial plaques are on the back wall of the church — read our History ). As Mary was the one chosen by God to bring her son into the world, let us show our affection to her by welcoming Jesus into our Hearts. May you bear the light of His Love! Initial meeting with Pastor and arrangements at least six months in advance. Empowered by the Eucharist, we exist to give glory to God through worship, sharing the good news, having special devotion to the Blessed Virgin Mary, and reaching out to serve those poor in spirit and in resources. The later applies in a special way to our twin-parish, St. Michael’s in Kijungru, Tanzania, East Africa. Click this link to access the Old St. Mary’s Mobile App which provides information, useful tools and resources to parishioners and visitors and gives the pastor and staff a powerful new way to communicate with members of the parish and the community at large. Now available for free on all mobile devices including Android, Apple and HTML5! 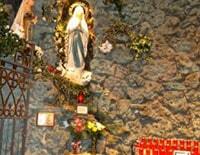 View our 3 grottos, reliquary, and wood carved stations of the cross. 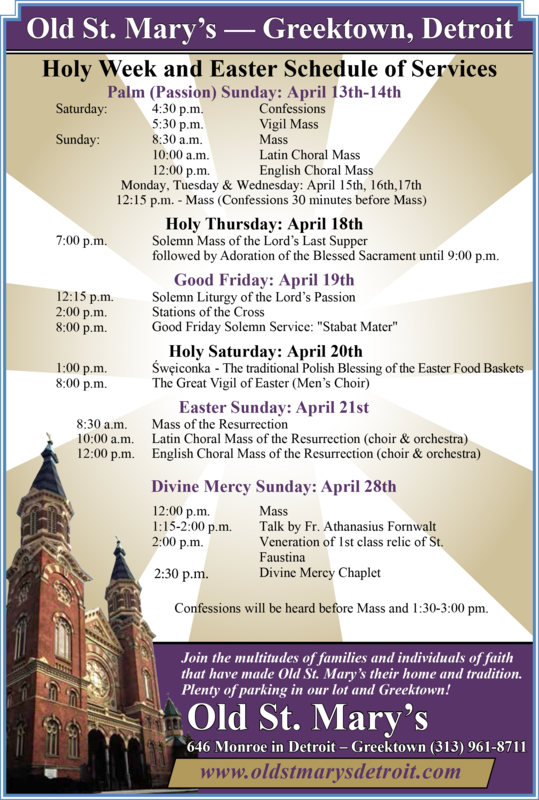 The Church is open Monday – Friday from 11:00 am till 2:00 pm., Saturday from 11:00 a.m. until 1:00 p.m. and from 4:30 p.m. until the end of 5:30 p.m. Vigil Mass. Church is open Sunday from 8:00 a.m. until 2:00 p.m. Private and self-guided tours can be arranged. Go to our ‘Contact’ page for information on location, parking, etc. The Sisters of Jesus the Crucified Christ provide Religious Education for children ages 6 to 14. Children’s Religious Classes are every Sunday in January from 11 AM to Noon in the Parish Center. 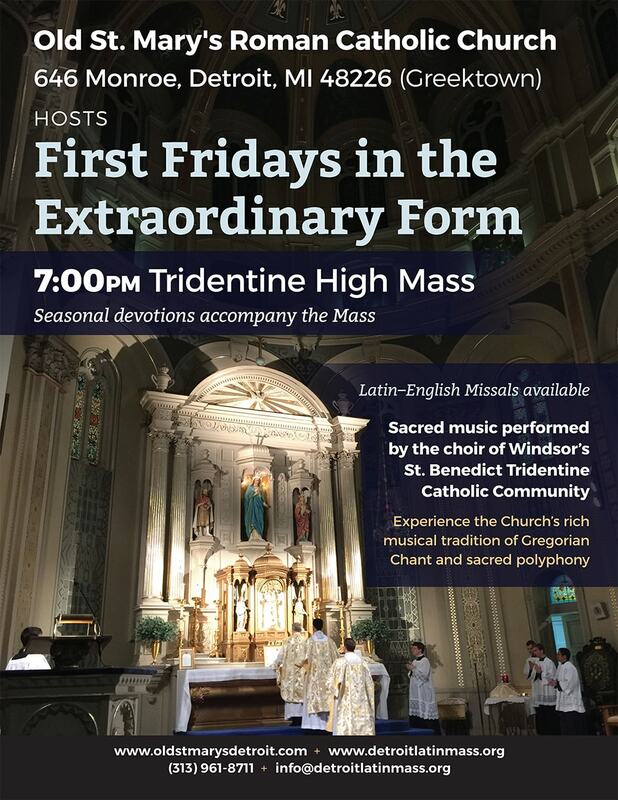 Call the parish office at 313-961-8711 for more information.